I was really looking forward to taking Ryan’s kids to Red Rock Canyon to explore and play and swim. Whenever I have family in town, Red Rock is a must-hit as it is a fun and very unique place. 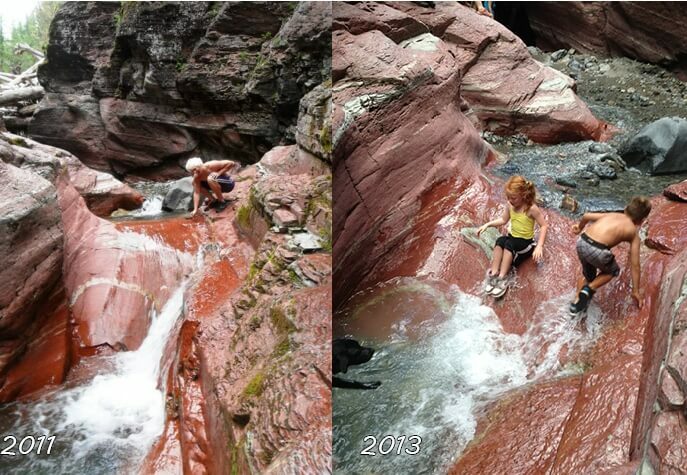 But the June floods have changed this iconic Waterton tourist spot. The first thing you notice is that there is little to no water. The stream is a trickle and there are several dry spots where it just stops altogether. The famous spot where my sister Leilani thought she was going to drown is a 2 inch stream you step through now. Besides the lack of water, there is very little red rock on the canyon floor. A ton of gravel and mountain shale has washed over the bottom of the canyon so instead of the vivid reds and yellows, it is a bottom of grey, like any other creek. 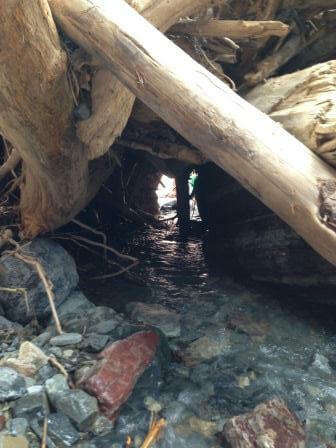 I am guessing that the flow has changed so greatly because when we got to the log jam dam that used to be the turnaround point, a small cave has been washed through it and goes to the other side! It is a very small hole and I had to crouch all the way down to fit through. It probably wasn’t very safe but on the other side was a previously unexplored side of the canyon! This used to be completely blocked off. Now we head through the little cave. 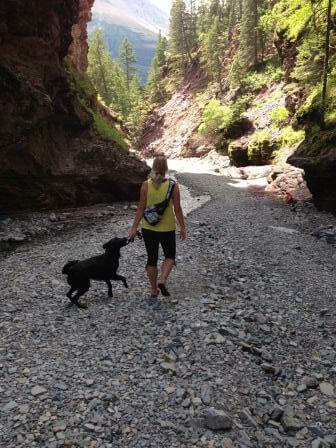 We walked up for a while longer, sat and had lunch, and enjoyed the part of the canyon that had way less people in it (not everyone wanted to brave the cave). But the kids were getting cold and tired so we sadly had to turn around and head back. I told Ryan we have to go back and spend an entire day going as far up the canyon as possible. I know! I was pretty bummed out. It really is. 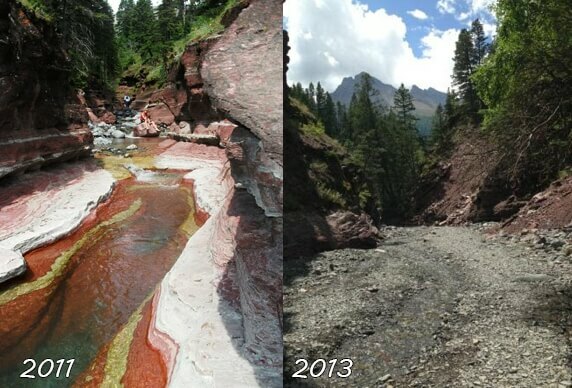 It will take years for the stream to wash away the shale and reveal the red rock bottom again.